The symbol one made me laugh pretty good, I loved the eye. Although a totally different gag, this stick figure cartoon, reminds me of one you did (1-21-07). I remember it, because it's one of my all time favourites and I have it taped to my computer desk. However, there is a lot more detail in the one you did then. BTW this one is good also. 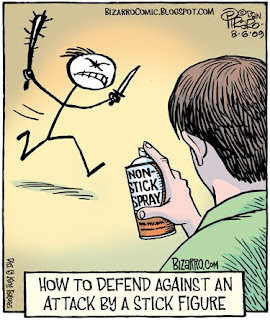 I guess it's something inherently funny about stick figures (and in this case: non-stick cooking spray). The alternate version is fantastic. I'll tell you what, if you submit the alternate version I'll name my imaginary best friend after you. Imagine it: Wilfredston T. Smothersfootsy - Imaginary Best Friend of Jonathan. It has a nice ring to it, doesn't it? It's got me excited, too. Let me know! edit: Hey...[rereads blog banner]...Nevermind. The deal's off, 'Dan'. I can't even begin to say on how many levels this cartoon speaks to me (and you should all be thankful for that; it would involve a long, boring account of my personal history). I am in a decisive battle against a stick figure tomorrow. The resemblance is uncanny. Thank you for this cartoon, and thank you for the timing of it. You so keep me coming back for more and more. You had me at hello and you complete me. Banana peels are handy for this purpose, as well. Stick figures having a very small, narrow braincase, they never fail to step on the peel. This includes fashion models, BTW. Shouldn't this be STICKy spray? ?